This is a nice picture, isn’t it? Dad reads the Bible while the kids sit and listen quietly. 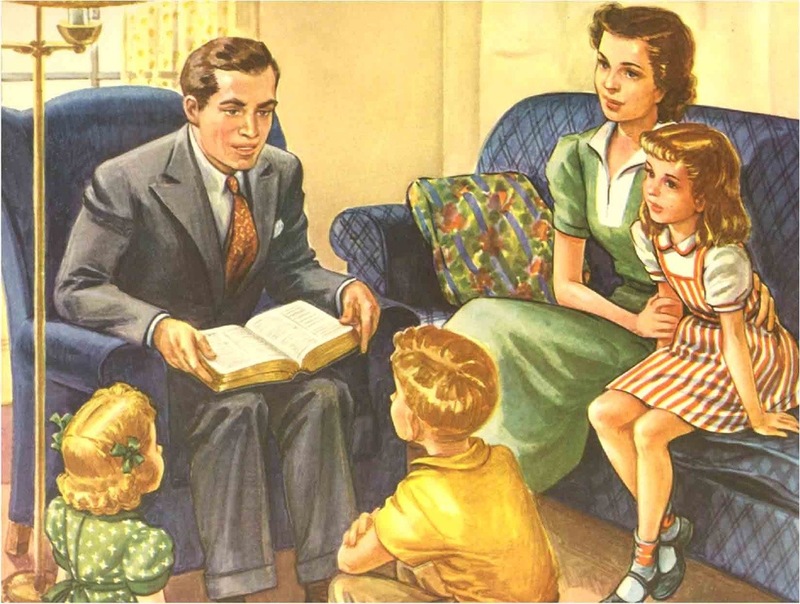 As nice and cozy as this picture is, the idea of a family reading the Bible together seems unrealistic. You’re probably thinking, “Yeah right! Like that could ever happen in my house!” In a time of iPhones, MTV, and XBOX 360, it’s likely the only thing your kids read is text messages. In a time of e-mails and iPads when you work overtime or not at all, it’s likely the only thing you think about is work. Can you imagine how wonderful it would be to sit down and read the Bible with your kids? Most evenings my family has what we call “Family Bible Time”. We set aside fifteen to twenty minutes between bathtime and bedtime to read Bible stories, sing kids’ church songs, and pray together. Although my daughter resisted when we started this habit over a year ago, now she depends on it as part of her nightly routine. If we miss this time then as we try to put her to bed she says, “No! You didn’t read Bible stories to me!” We aren’t as picture perfect as the family in the photo, but we do read the Bible together and it is wonderful. You and your kids won’t just sit down and read the Bible together. You have to intentionally set a time and stick to it. Pick a time in your day that’s consistent. It has to be the same day-in and day-out, a time you can count on. It can be in the morning or afternoon before or after school. It can be in the evening before or after dinner. Or it can be at night before the kids go to bed. Think about the natural rhythm of your family’s day and make it work for you. There are Bible resources for kids of any age and grade. Get your kids a Bible they can relate to at their level. For younger kids, there are childrens’ Bibles and Bible storybooks. For older kids, there are students’ Bibles and study Bibles. There are audio Bibles, Bible reading applications, and Bible Study software. They can have the Bible on their iPod, smart phone, and laptop! The Bible you read as a family should be one your youngest kids can understand. But you should also provide your older kids with more advanced resources for their own study. The idea is to give your kids the right tools at the right time. Where can you find these tools? Christian bookstores, used bookstores, Walmart, the App Store – anywhere! The trick is to keep your eyes open. It’s never too early to start. Your kids can enjoy reading the Bible no matter how young they are. Whether they’re infants, toddlers, or elementary school students, you can teach them to know God by reading His Word. It’s never too late to start either. Your kids can start reading the Bible if you form the habit and enforce it with firm but gentle love. If you don’t read the Bible, now is a great time to start! Your kids will be blessed from simply seeing you read the Bible on a regular basis. If you don’t know much about the Bible, that’s okay. Don’t pretend to be an expert. Learn alongside your kids. Share your excitement for God with them by spreading your enthusiasm for His Word.